So I finally have something to show for my floral monograms! After debating between a very simple one with flowers hot-glued to a piece of a fabric and a more complicated one made with styrofoam and lots of flowers, I finally decided that it wouldn't be too difficult to do the complicated one and that it looks a lot nicer. Unlike the leaves project, I didn't consider this as tedious. Actually I thought this was kinda fun, a bit like knitting (adding stitch by stitch is similar to adding flower by flower). I started off with a 12"x36"x2" block of styrofoam from AC Moore. This cost about $7. Next I got a bunch of red hydrangeas from Save-on-Crafts. A dozen of them reduced the price of each to $1.50. I also got some green wire to create something to hang it all with. I then printed out a really large version of the monogram that I had designed in Illustrator. I made it big enough to stretch across a few sheets of paper (you have to set your print preferences to 'tile'), or about 15"x15" (my letters are more square in shape). I taped the papers together in their appropriate places, which was a little tricky b/c each sheet printed with a slight margin and the "R" didn't print out exactly as I wanted. After that, I pinned the paper in place with straight pins (they leave such a small mark that it's hardly noticeable, yet are long enough to hold the paper in place). I first tried push pins (too short) and tape (didn't really hold after I cut parts of the paper) so I recommend straight pins. Now to the cutting.... This was a bit tedious and at times, painful. I began with a box cutter that I extended and locked at the exact thickness of the foam so that the blade would cut it without going so far through the other side that it would cut my thighs (I left the foam on my lap). However, I think that I didn't plunge the blade in totally straight so that it seemed slanted and I switched to a pair of sharp, metal scissors that I pushed through to the other side so as to form a bunch of slits (kinda like a dotted line). I got tired of this and tried a wooden pencil which definitely got straight through to the other side and then I "connected the dots" with the blade. Pushing the pencil through hurt the palm of my hand after a while but I eventually got it all done with either the scissor or pencil. The parts "carved" with the pencil were quite rough and I attempted to smooth it out with the blade but got lazy and just left it with the ridges, since the flowers would cover it all. 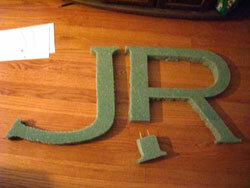 Because the foam's width was only 12", about 3" of each letter did not fit on the foam. I cut those missing parts out of another part of the foam and then connected it with some toothpicks and hot glue. High temp hot glue is not recommended b/c I could see it start to melt the foam but I didn't want to buy another glue gun nor did I want to buy a whole tube of styrofoam glue for a few pieces. Here are the full letters put together. I think the connections are barely distinguishable (top of the "J" stem and bottom of the legs of the "R") but for that last piece, which was cut out of the very end of the scrap piece of foam so it was a little disfigured. I also wrapped a piece of the wire around the top of the letters so that I could attach a ribbon from it later on. For the "J" I had to also tie a piece of string around the stem (I just happened to have green string too) and then twist the wire around that so that the wire goes from front to back. In retrospect I don't know why I didn't just use the string instead of the wire -- the wire kinda cuts into the styrofoam whereas the string doesn't and is easier to attach. Then the fun part of adding the flowers! I pulled off each of the individual flowers of the hydrangea blooms and then pushed it into the foam. The best part about this was no need for glue! I think hydrangeas work well because you get so many flowers from one stem -- I still have a bunch left over that I can use for something else (the picture below shows how many flowers I got from one stem, with the deflowered stem next to a full one). 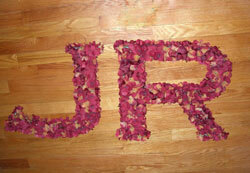 My mistake, though, on the first letter was putting in the flowers without flattening them a little. 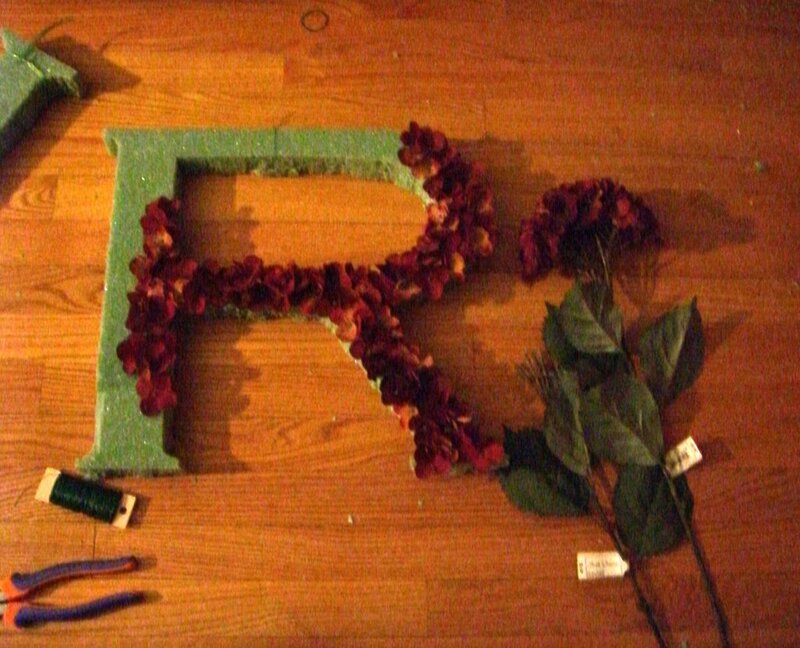 This makes it look more lush and uses more flowers (the "R" weighs significantly more), but if you look closely you can also see the foam showing through. For the second letter I flattened and also tried to position the next bloom in such a way so as to hold it flat. Also, I should have put the flowers on the sides first so that the letters are easier to handle as more flowers are added. From the pictures, I see that the camera flash makes the green foam in the background stand out more so I'll have to go back and add more flowers or add dabs of glue here and there to hold the petals down. I also have to buy a length of ribbon to tie to each of these and find a place to store these so that they don't get dusty and/or flattened. I was also thinking that after the ceremony, I may put these on an easel by the entrance, stand them up on a table (for which I'd have to make a stand with the leftover foam and perhaps the hydrangea leaves), or lay them down either on the cake table or the sign-in table. Aside from some of the foam showing through, this is near complete and you can see how the slight roughness or unevenness of the foam doesn't affect the overall shape (unfortunately my photo-taking skills leave much to be desired).